I was browsing the Illusion Knitting thread on Ravelry and was pretty impressed with the big wall hangings - just the scale of them, and the careful shading really blew me away. There were quite a few musicians in there and I thought about trying to chart someone from the world of metal. 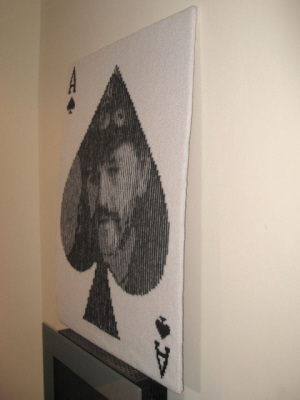 It suddenly came together in a flash - my husband’s a massive Motörhead fan and he had a significant birthday coming up later in the year. 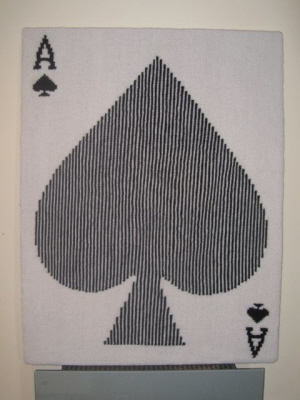 When I started browsing through pictures of the band I just kept coming across images of the Ace of Spades and it just popped into my head - what if I made the illusion part of a giant playing card? When I first started thinking about this piece, I had absolutely no idea how the principle worked or how to go about charting, so I spent a long time reading and rereading the tutorials on the Woolly Thoughts website to make sure I understood how to make it work. What I really wanted to do is buy and knit someone else’s chart first, to get experience, but I was so excited about Lemmy that I couldn’t face delaying! I used Photoshop Elements and then Excel to help me create the chart and that worked pretty well.